One of my Christmas presents was a DVD of the film Jigsaw. Somehow neither of us had come across this before and we both loved it. Released in 1962, the screenplay was written and directed by Val Guest. The plot is a murder mystery and manages to be a gripping police procedural and a fine example of British film noir. 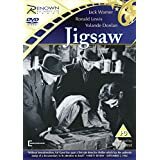 All the more interesting as Jigsaw is adapted from Sleep Long, My Love, a 1959 novel by American mystery writer Hillary Waugh (1920-2008). Waugh became widely admired for his documentary-style procedurals, a style inspired by reading true-crime studies. Sleep Long, My Love was set in small-town Connecticut and its easy adaptation to an English seaside town illustrates how universal are the themes of deceit and murder. Jack Warner stars as Detective Inspector Fred Fellows. I’ve always liked Warner, having grown up with fond memories of Dixon of Dock Green on Saturday evenings – his character there was more or less lifted from a more famous British noir, The Blue Lamp (1950). In Jigsaw, Warner plays his usual avuncular detective, yet with a harder, no nonsense edge. His Inspector Fellows is determined to find the murderer on his patch, assisted by his likeable sergeant, well-played by Ronald Lewis. The plot is full of credible detective work, twists and turns, hence the title. There’s a classic beginning of a woman in a drably furnished bedroom – ashtray by the bed – soon to be murdered by her unseen lover. In some ways this reminded me of a Francis Durbridge drama – although not quite so convoluted – in part because Moira Redmond was cast as the murdered woman. She always seemed to have a strong screen presence and memorably played the title role in the 1972 TV drama re-make of Durbridge’s Melissa. Jigsaw is largely filmed in and around Brighton and benefits from that atmospheric setting, chosen by generations of novelists and film-makers. A natural choice as the plot has similarities to the infamous Brighton trunk murders of the early thirties. The setting was one reason that attracted me as I’ve known the town well for many years and never walk those streets without thinking of its literary dark side. I love black and white films and murder/mystery plots are enhanced by a world of monotones, contrasting sunlight and shadows. Brighton here is shown at an interesting transitional time. This is not the famous town (now city) of the Prince Regent’s Royal Pavilion roof-line or the lively Palace Pier. We glimpse the sea-front with the lovely old West Pier still intact but this is back-street Brighton of seedy, peeling stucco, corner shops and rooms to let. The surrounding bare hills are just beginning to be marked by footings for new houses. The period motor-cars are an added pleasure along with some atmospheric shots of Brighton and Lewes railway stations in their steam hey-day. The cinematography is very effective. The murderer is seen in glimpses without the face. We don’t see the body but we watch the reaction shots of the detectives’ faces as they throw open a trunk lid. The camera dwells lovingly on wet streets by night, cigarette smoke, the Cutty Sark on a bright morning. As so often in these films, another pleasure is seeing a turn-out of familiar character actors, here including Ray Barrett, John Barron, Michael Goodliffe, John Le Mesurier and Brian Oulton. American actress Yolande Donlan – Mrs Val Guest – does an immaculate British accent. Hillary Waugh wrote eleven crime novels featuring Police Chief Fred Fellows. They’re going on my reading pile when I can track them down. Warning – If you plan to buy the film, be aware that the blurb on the reverse of the DVD gives away the identity of the murderer! This is an appallingly careless thing to do and we’re indebted to a kind Amazon reviewer who pointed this out. It was hard not to read the back before viewing but I’m so glad I managed. A highly recommended classic. It’s hard to believe that the Saint, Simon Templar, has been entertaining readers for nearly ninety years. Not only in the wonderful books by Leslie Charteris, but in films, on television and radio, and in comic strips. I’ve read the Saint books now for many years, but had never read Meet the Tiger, his first appearance in print in 1928, written by an author who was only about twenty years of age, as one of a series of thrillers for the publishers Ward Lock. Meet the Tiger is an astonishingly assured book for such a young author, though Charteris rather frowned on the title in later years, suggesting that the Saint’s real debut should be in the slightly later volume Enter the Saint. The Saint doesn’t even get a credit in the title – the Tiger is the villain – though this omission was corrected in later editions. You can see why Charteris was unsure. The Saint as portrayed in Meet the Tiger is not quite the Simon Templar we come to know and love in later volumes in the chronicles. He’s not so self-assured, the witty repartee is not, well, so witty , and he’s not so brave. There is a sequence where Templar is lost in some caves when he comes close to panic. But then the Saint of Meet the Tiger is portrayed as a slightly younger man than subsequently. 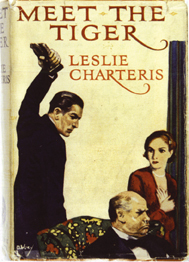 Charteris seems to have been so unsure with his hero’s first appearance that he left the Saint alone for a couple of years after Meet the Tiger and wrote novels with other heroes. The Saint of Enter the Saint and subsequent books marks the most wonderful readjustment of any other hero in thriller writing. Meet the Tiger is fast-moving, elegantly written and sows the seeds for a character who was to become one of the icons of thrillerdom and known and adored by millions of readers around the world. Every fan of the Saint should seek out his first appearance. In this book the Saint is in Devon seeking out a villainous mastermind called The Tiger. All we know at the beginning is that the Tiger is living in the seaside village of Baycombe. We don’t know who he is and neither does the Saint. This is very much a who-is-it rather than a who-dun-it. In typically Saintly fashion, Templar is more interested in laying his hands on the Tiger’s boodle as much as bringing him to justice. The Saint of this first book has some of the attachments of his later life. He has his manservant, Orace, a wonderful creation who plays a bigger part here than in the subsequent tales where he makes briefer appearances. I’m rather a fan of Orace. A pity in a way that Charteris never used him in quite the same way again. The book marks the very first appearance of the Saint’s girlfriend Patricia Holm, surely one of the most delightful heroines ever to grace a page of any thriller. In fact, for some long portions of Meet the Tiger she makes much of the running, while the Saint himself is off-page. One of the reasons I love the early Saint books the best is because of the presence of Miss Holm. Saint books without her are never quite the same. Meet the Tiger is a tremendously exciting read. Even if you guess who the Tiger is – and I did – there is still another terrific twist in the tale. I do think Leslie Charteris – a wonderfully creative, witty and innovative writer – was hard on this early appearance of The Saint. For a writer barely out of his teens it’s a remarkably well-written and assured debut. Eventually it re-appeared in a editions with the Saint getting a mention in the title. I’m unclear if Leslie Charteris revised the text at all – perhaps one of my Saintly readers might know? I have over the past couple of years blogged on all of John Buchan’s Richard Hannay thrillers, with the exception of The Island of Sheep (known in some American editions as The Man From the Norlands), published in 1936 and the last pure thriller Buchan wrote before his untimely death in 1940, during his period of office as Governor-General of Canada. I first read John Buchan when I was in my teens. He remains one of my favourite authors; to my mind nobody quite did what he liked to call ‘shockers’ quite as well. I can well remember my first teenage reading of The Island of Sheep, by candlight in a tent on a camping expedition. The story gripped me then and has since, though I know it almost by heart. Richard Hannay is the hero of some of Buchan’s finest novels, from The Thirty-Nine Steps, through Greenmantle and Mr Standfast, to The Three Hostages. Rather like its author, the Hannay of The Island of Sheep is growing old. He feels himself to be sluggish, out of sorts, his adventurous past just memories. Then an incident from his distant past, when he was a mining engineer in South Africa, comes back to haunt him. He recalls a siege against villains, when he came to the assistance of a Norse fortune-seeker called Haraldsen. At its resolution, Haraldsen makes Hannay and his friend Lombard swear an oath to come to the protection of himself and his family should the need ever arise. A promise forgotten over the decades. Hannay is now a middle-aged country squire, Lombard an overweight and out of condition banker, and the third member of the trio – Peter Pienaar, the Boer hunter who appears in several Buchan novels, killed in the Great War. Haraldsen is dead too, but his son is alive, being pursued by a gang of blackmailers and extortioners. The younger Haraldsen meets Hannay again in Norfolk, worn out, a man on the run. So Hannay and Lombard – aided by Sandy Arbuthnot, the hero of Greenmantle – find themselves secreting Haraldsen away, first at Hannay’s home in the Cotswolds, and then at Sandy’s home in the Scottish Borders. Along the way are many adventures, including a magnificent car chase up the Great North Road – perhaps the best car chase in thrillerdom, certainly the best written. There is another pleasing addition to the gang of allies, Hannay’s son Peter John, a keen naturalist whose knowledge of the ways of wild geese helps to save the day. Peter John is very much a chip off the old block – he is based on Buchan’s own eldest son, who himself wrote splendid memoirs of his life in Scotland and adventures in natural history. Buchan dedicated this book to his son. After alarms and excursions in the Scottish borders, the action moves to Haraldsen’s home, the Island of Sheep of the title, set in the wild landscapes of the Faeroe Islands, where the action comes to an exciting climax in what can only be described as a Viking ending. To my mind, no writer comes close to Buchan in describing wild landscapes, whether it be the meadows and woodlands of the Cotswolds, the glens and hillsides of the Scottish Borders, or the windswept islands of the north Atlantic. His knowledge of the land came from his own explorations. He was, for all his life, a great walker and considerable rock climber. He captures the spirit of the place in a way that haunts your mind long after you’ve finished reading one of his books. I’ve walked many of the landscapes which inspired Buchan. He got them right. He was also a very fine literary artist. Probably one of the best writers who turned his hand to writing thrillers. No matter how many times I read his books, I always want to start again. If any writer inspired me to write the kind of books I do, it is John Buchan, though I make not the slightest claim to have anything like his great genius for such stories. My own Scottish thriller Balmoral Kill is my own small tribute to this wonderful writer. 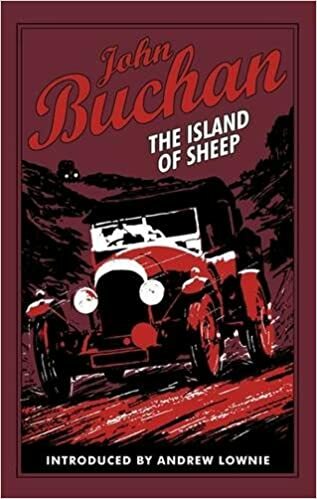 It is pleasing to see that Buchan is now taken seriously as a great Scottish novelist, after years of being sidelined and saddled with misconceptions by critics who rarely actually read what he wrote or studied the truth about his life. The Island of Sheep is a fine conclusion to the Richard Hannay stories.